Light-weight replacement clip-on handlebars for sportbikes. 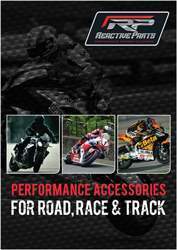 LighTech's racing clip-ons can be used by both street riders and racers alike. Simply measure your front fork diameter and select the corresponding clip-on size. Installation Note: Please check your motorcycle for adequate fairing clearance with raised clip-ons by turning your handle bars from lock-to-lock.